So today I decided to take a break from all that and work on a table. I fixed a couple more bugs that snuck in to bite me. (yes, I know “snuck” isn’t supposed to be a word; I like it, and my spell checker can bite me, too) I’m not sure how long the one with .SPACE has been around … I’m guessing a bit under 2 years, because that’s an old part of the code. And in all that time, nobody reported a major bug in it. I have to figure that’s not one of the more commonly-used commands in TBL. Like, apparently, at all. On a related note, Saturday is officially the 2nd birthday of Wintertree Mk.2 — I count from the day I registered wintertreeredux.com. Two years of this … it didn’t seem this hectic the first time around! Of course, at that point I was selling TableMaster, a couple of Table Packs, and I think the earliest version of Arcane Alphabets. As of today, I’ve got 49 line items over on DriveThruRPG — two were special holiday bundles, but the other 47 are actual things I’m selling. Fonts. Software. 1001 Things. Eeep. No wonder it seems hectic! Two years of turning the grind crank. Y’know, I love it! I particularly love when I talk to someone — in person or online — and they tell me they’re an old TableMaster user from the old days. Though I think the part I love the most is when someone tells me what they’re doing with TableMaster, and they’re doing something cool that I never thought of doing myself. (I’m just not that imaginative a person) Or when people show me tables they’ve written, and they’re making TBL do things I didn’t realize it could do, and I’m the one who wrote it! 1.4.5 will definitely have a version-checking feature. Click the “check version” menu option, it’ll go to my new version-checking web page and tell it what version it is, and the web page will tell you if it’s the latest or not. On a related note, just as sort of an Easter egg, if you click on the TableMaster II logotype in the “about” screen in 1.4.5, it will take you to the Wintertree website. First, yes, there is a bug in .JOIN/.ATTACH (and a typo in the manual). I just fixed that, but clearly it’s worth a maintenance release, at least. Second, a new command. Of course there’s a new command, right? This one is actually a significant one: .CAPTURE. It’s out! The upgrade is now at http://www.wintertreeredux.com/product/ for all TableMaster owners. There are a lot of new features, as I have discussed in previous blog posts. I’ll post the changenotes after the break. New features: 7.5 new commands. A new output formatting code. Extensions, using the new ! modifier, to four output formatting codes. The first meta-command. A bunch of GUI tweaks. A whole lot of bug fixes. 7.5? Well, yes, the .5 of a command is .RESET ALL. That actually translates to a different opcode in TableMaster’s innards (creatively called resetall instead of the normal resettable). So it doesn’t look like a new command, just a parameter, on the surface, but it really is one underneath. Hence 7.5. Out of all my fonts, Medu — the authentic hieroglyphic one — is probably my favorite. (it’s for sale on DriveThruRPG if you’re interested) And, probably unlike the average person (but then again, are any of us gamers average people?) I have played around with real papyrus a time or two. Naturally, these things converged. 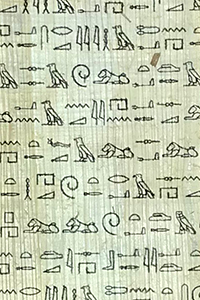 Specifically, they converged in that this morning, I successfully printed some text (the Negative Confessions) in Medu on a piece of real papyrus! The example to the right is a detail from the printout. A picture of the full page, and more information about how I printed it, is after the break. This isn’t the biggest change of all time, but it’s a darned useful one. Once again, it’s using ! to extend an output formatting code. Almost long as there has been a TableMaster, there have been the \C and \c output formatting codes. They arrived with embedded subtable calls, back in 1994 I think. And since 1994, it’s been bothering me that if that embedded call returns more than one word, only the first word will be capitalized. Most of the time, that’s what you want. But sometimes, you need a 2-word (or more) result, and you can’t just capitalize it in the table because that table is also being called elsewhere and shouldn’t be capitalized there. So for 24 years it’s been bothering me.